Shimano Calais 100A **LIKE NEW #3 [Calais 100A #3] - $310.00 : The Tackle Trap, Inc., It's all about fishing tackle! 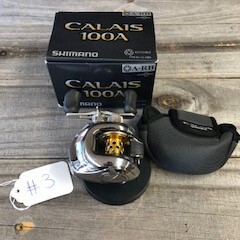 The Tackle Trap has this like new, Shimano Calais 100A reel in stock and ready to ship. Each reel comes with the box, cover, and paperwork. Contact us at 256-281-6160 for any questions.